Palmia Observatory: Flying to IAU Symposium 338, Gravitational Wave Astrophysics and LIGO tour; UCI Physical Sciences Breakfast & Lecture; JPL tour; Tying gravity and quantum mechanics together? Flying to IAU Symposium 338, Gravitational Wave Astrophysics and LIGO tour; UCI Physical Sciences Breakfast & Lecture; JPL tour; Tying gravity and quantum mechanics together? We I am traveling today to Baton Rouge, LA, for the upcoming IAU Symposium 338 on Gravitational Waves in Astronomy. Tomorrow I hope to report on the big press release that everyone is expecting concerning the latest LIGO findings, but for now let's review some of this weeks activities. 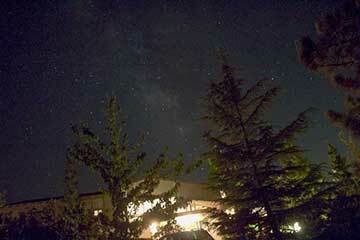 First up, the Anaheim Hills fires have disrupted and now cancelled the OCA Blackstar Canyon observing party. We had hoped to make it there this month but with busy travel schedules and now the fire, it just is not going to happen. This is a really bad fire season, what with the especially destructive and deadly fires in the Napa area and now there is another little brush fire near Santa Clarita, which if the ash gets really bad could interfere and maybe cancel our planned observing session on the 60 inch telescope on Mt. Wilson. We just have to wait and see. 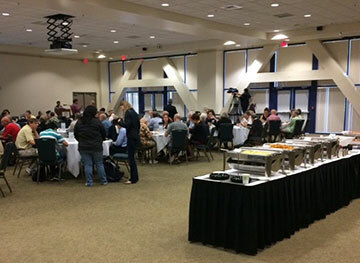 Before that though, I attended the UCI Physical Sciences breakfast and lecture, where we heard Professor Jenny Yang talk about "Understanding the Chemistry that Powers our Planet." Although we tend to like lectures more in the physics area rather than chemistry, the free breakfast was great and her topic was actually very interesting. (1) Todays chemists can do something like artificial photosynthesis where CO2 and H2O are combined to make hydrocarbons, but the process requires expensive and rare catalysts like Pt and Ir. (2) Nature does the same process with metallic catalysts based on low cost and available metals like Fe and Mn. The development of new low cost catalysts is crucial. (5) There is hope and we don't have to worry about going without energy in the future because of the freely available sunlight and these new catalysts and new technologies, when they are developed, will mimic nature, but likely with higher efficiency, and allow increased low cost energy storage and more carbon neutral sources of energy. So, in the future be sure to check out this great lecture series which comes with a free buffet breakfast! 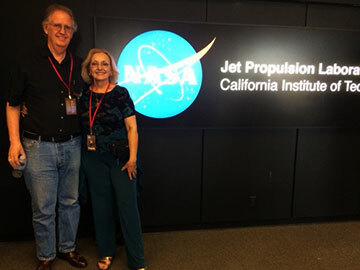 This busy week also included a group tour of the Jet Propulsion Laboratory in Pasadena, CA. This tour, while not as technical and without the access to many of the laboratories which I had seen on previous tours years ago, had a very big advantage and that was that it came with a tour bus and guide. Not having to drive to/from Pasadena during the daytime on a Friday and not having to park an auto at JPL, was well worth it. There have been many conferences at Caltech and at the Convention Center in Pasadena, but whenever I attend those events, I usually choose to spend the night there rather than drive the dreaded 210 Freeway to and from the event. So, Resident Astronomer Peggy and I took up the offer and had a great day, first just sitting on the bus enjoying the drive there, which also included free time for lunch in old town Pasadena. 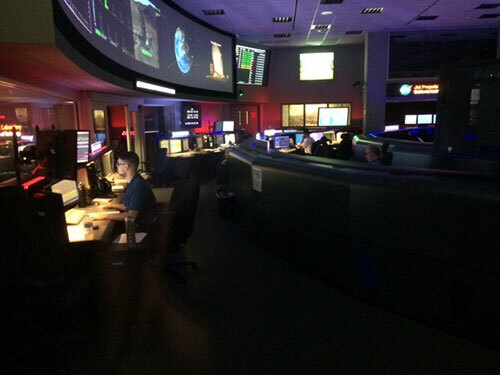 We were there on one of the low work, off Fridays, so it wasn't as crowded as it could have been and we had a chance to look inside Mission Control, where all of the unmanned, robotic space missions that JPL has designed are controlled and operated. We could tell it was a low key day when we were there because the maps of the Deep Space Network showed that nearly all of the antennas were offline and not much communicating with any deep space probes. 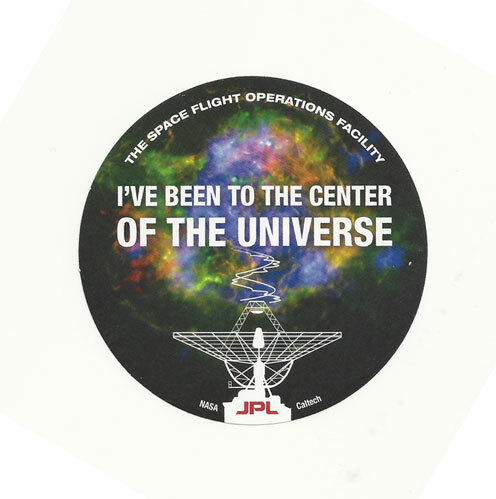 One of the stores we heard while we were there had to do with one of the early mission flight directors who keep thinking of that space as the center of the universe because that is where all the robotic missions sent their data and were controlled from there. So over the years that story has been symbolized in a drink coaster. Ok, now we have been to the center of the universe too! Ok, ok, it's time to consider some more serious physics and Sean Carroll's web post this week had a couple of videos which really took physics on a wild ride towards the path of eventual integration of gravity and quantum mechanics. This video lecture to Kings College students is about an hour long and available on his website. I've pasted one slide from his presentation below. 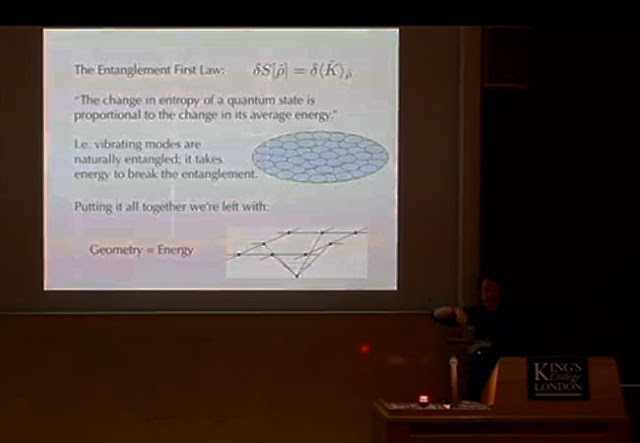 Sorry that it is not very clear, but this one slide illustrates one path being considered that considers gravity and being an emergent property of quantum mechanical entanglement. He knows that this approach might eventually blow up and fail but things so far look pretty promising. It was neat to hear here, and other previous lectures also, how entropy, a concept we often talked about in engineering thermodynamics, is in this new approach considered to be proportional in some weird way to the area. So, considering the quantum vacuum and some arbitrary area of that vacuum, then its entropy can be calculated based on the quantum fluctuations in that area. Now the more entangled the area is the higher the entropy and the higher the energy density of the area is and you get to the point where the higher energy density, which really also just means equivalently, more mass, then the geometry of the space changes, just as predicted by Einstein General Relativity. Well, that at least in a nutshell what if all seems to say and be about. It's pretty mind blowing and when you go back and put mathematics behind all of those separate topics it becomes really wild. Each topic whether it is entropy or entanglement or geometry and curvature or quantum vacuum is a hard topic just by itself. Anyway, we will have to wait and see if Sean and others are successful in making more progress and getting the whole approach to stick together without blowing up. Check out the video and others for more information.